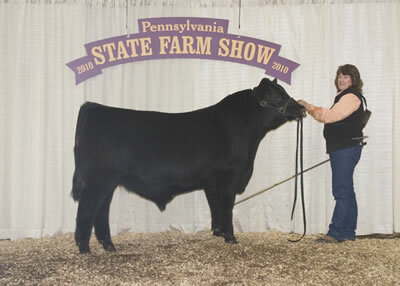 Check Mate won grand champion bull at the 2010 Pennsylvania Farm Show's Angus Show, January 11 in Harrisburg, Pa. Cherry Knoll Farm Inc., West Grove, Pa., and Katrina Frey, Quarryville, Pa., own the September 2008 son of Connealy Danny Boy. He earlier won senior calf champion. Dan Eversole, Blacksburg, Pa., evaluated the 125 entries. 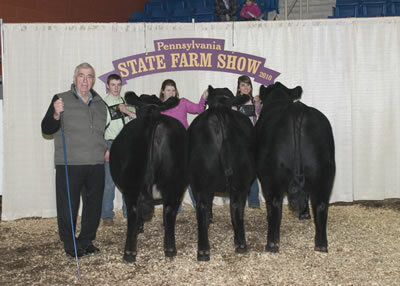 Rains Powerstroke PSNIFPN won reserve grand champion bull at the 2010 Pennsylvania Farm Show's Angus Show, January 11 in Harrisburg, Pa. Dale Rains, Mercer, Pa., owns the April 2009 son of Sedgwicks Powerstroke 7502. He first won junior calf champion. Dan Eversole, Blacksburg, Pa., evaluated the 125 entries. 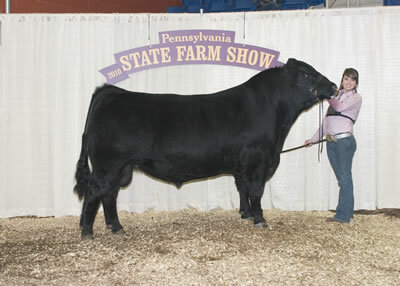 H J M Black Ice 707 won senior champion bull at the 2010 Pennsylvania Farm Show's Angus Show, January 11 in Harrisburg, Pa. Megan Fuls, Richland, Pa., owns the winning bull. 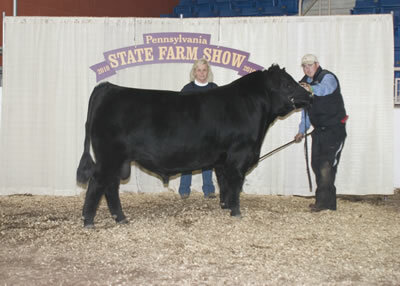 Bishards Structure 803 won reserve senior champion bull at the 2010 Pennsylvania Farm Show's Angus Show, January 11 in Harrisburg, Pa. Kelsey Poe, Stewartstown, Pa., owns the winning bull. 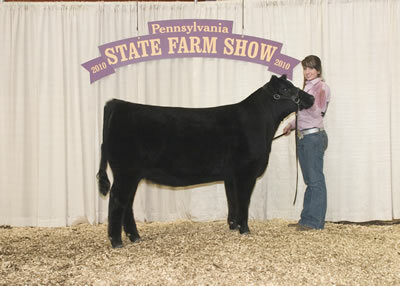 Freys KJF Forward P48 T72 won junior champion bull at the 2010 Pennsylvania Farm Show's Angus Show, January 11 in Harrisburg, Pa. Katrina Frey, Quarryville, Pa., owns the winning bull. 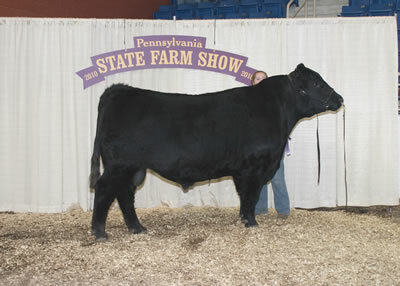 J D H Powerline 0758 won intermediate champion bull at the 2010 Pennsylvania Farm Show's Angus Show, January 11 in Harrisburg, Pa. J D H Cattle Company, Dover, Pa., owns the winning bull. 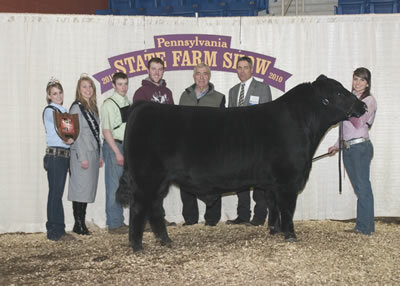 JJ Paul J858 won reserve intermediate champion bull at the 2010 Pennsylvania Farm Show's Angus Show, January 11 in Harrisburg, Pa. Chris Rerko, Belle Vernon, Pa., owns the winning bull. 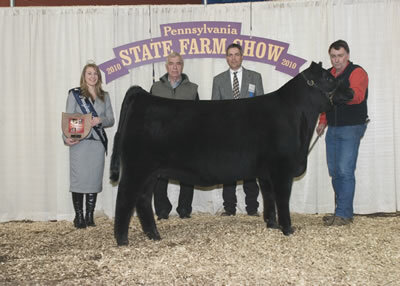 Rains Mandated MdLE722 won reserve junior bull calf champion at the 2010 Pennsylvania Farm Show's Angus Show, January 11 in Harrisburg, Pa. Dale Rains, Mercer, Pa., owns the winning bull. 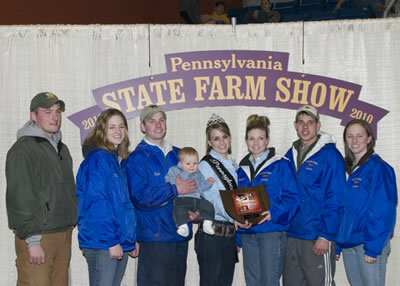 Rains Skylight Pearlette PsN won grand champion female at the 2010 Pennsylvania Farm Show's Angus Show, January 11 in Harrisburg, Pa. Dale Rains, Mercer, Pa., owns the January 2009 daughter of Sedgwicks Powerstroke 7502. She earlier won early junior calf champion. Dan Eversole, Blacksburg, Pa., evaluated the 125 entries. 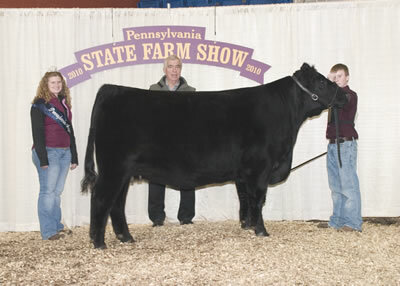 Freys KJF Arkpride P48-T105 won reserve grand champion female at the 2010 Pennsylvania Farm Show's Angus Show, January 11 in Harrisburg, Pa. Katrina Frey, Quarryville, Pa., owns the September 2008 daughter of Connealy Danny Boy. She first won senior calf champion. Dan Eversole, Blacksburg, Pa., evaluated the 125 entries. 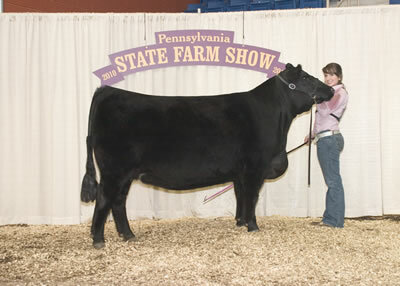 Just Enuff Lutton Carly won senior champion female at the 2010 Pennsylvania Farm Show's Angus Show, January 11 in Harrisburg, Pa. Kyle Livingston, Dover, Pa., owns the winning female. 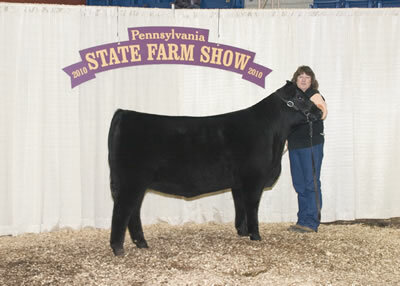 Freys KJF Delia M90 T26 won junior champion heifer at the 2010 Pennsylvania Farm Show's Angus Show, January 11 in Harrisburg, Pa. Katrina Frey, Quarryville, Pa., owns the winning heifer. 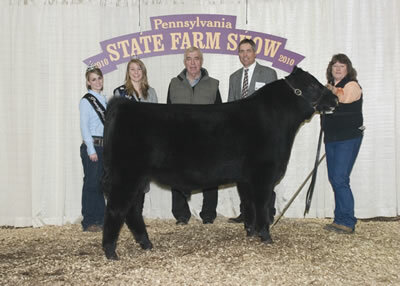 Rains Power Dream Girl PsHP won reserve junior champion heifer at the 2010 Pennsylvania Farm Show's Angus Show, January 11 in Harrisburg, Pa. Dale Rains, Mercer, Pa., owns the winning heifer. 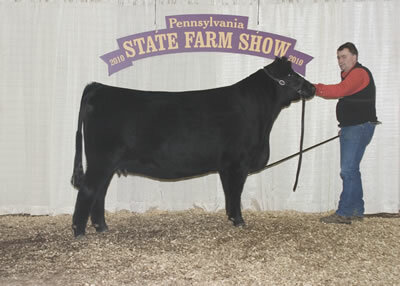 Freys Cheryknol Arkpride U57 won reserve early junior heifer calf champion at the 2010 Pennsylvania Farm Show's Angus Show, January 11 in Harrisburg, Pa. Katrina Frey, Quarryville, Pa., owns the winning heifer. 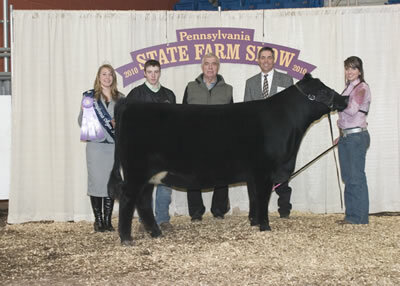 Rains Dreamer Girl CrFrRLE won late junior heifer calf champion at the 2010 Pennsylvania Farm Show's Angus Show, January 11 in Harrisburg, Pa. Dale Rains, Mercer, Pa., owns the winning heifer. 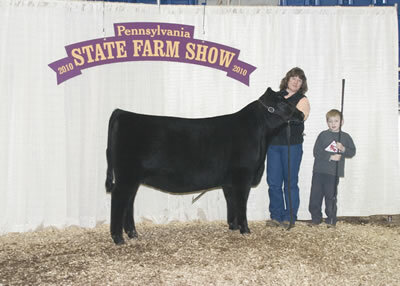 Rains Forever Babs LoNHFR won reserve late junior heifer calf champion at the 2010 Pennsylvania Farm Show's Angus Show, January 11 in Harrisburg, Pa. Dale Rains, Mercer, Pa., owns the winning heifer. Just Enuff Twister Marci won grand champion cow-calf pair at the 2010 Pennsylvania Farm Show's Angus Show, January 11 in Harrisburg, Pa. Sal Melo, Lehighton, Pa., owns the March 2005 daughter of Da Es Ro Twister 0627. 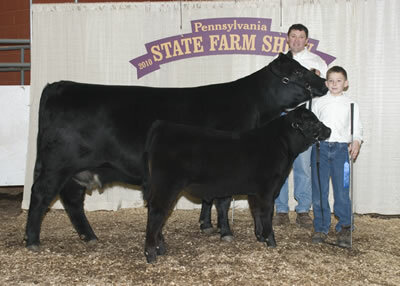 An October 2009 bull calf sired by W C C Special Design L309 completes the winning pair. Dan Eversole, Blacksburg, Pa., evaluated the 125 entries. 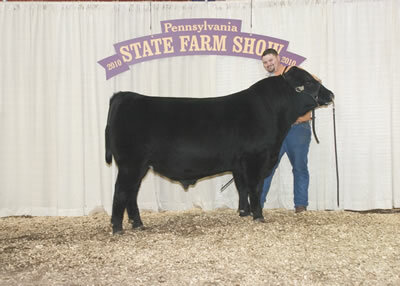 The progeny of Connealy Danny Boy won junior get-of-sire at the 2010 Pennsylvania Farm Show's Angus Show, January 11 in Harrisburg, Pa. Katrina Frey, Quarryville, Pa., owns the winning trio. 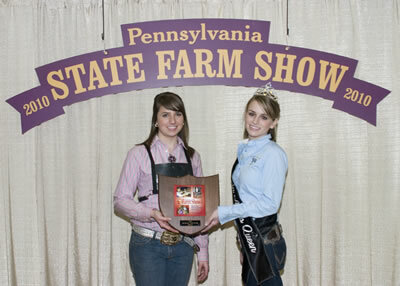 Dale Rains, Mercer, Pa., won breeders' best six head at the 2010 Pennsylvania Farm Show's Angus Show, January 11 in Harrisburg, Pa.
Katrina Frey, Quarryville, Pa., left, won premier exhibitor at the 2010 Pennsylvania Farm Show's Angus Show, January 11 in Harrisburg, Pa. Pictured presenting the award is Hannah Grim, Pennsylvania Angus queen. 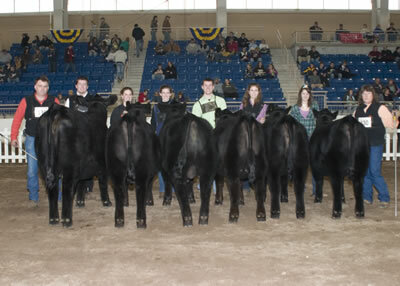 Beaver Creek Angus, East Berlin, Pa., won premier breeder at the 2010 Pennsylvania Farm Show's Angus Show, January 11 in Harrisburg, Pa. Pictured from left includes Derek Smith, Kait Fairman, Kyle holding Kolton, Hannah, Sarah and Denton Grim and Casey Schaffer.